I don’t even want to think about how many hairbrushes I’ve bought in my life. As soon as I see a new brush in the shop, curiosity grabs me and often one ends up in my shopping basket. But only a small selection remained in the end, many I gave away. I would like to start with my three All-Time-Favourites! The detangling brushes were a revelation to me, I hated nothing more than pulling knots out of my hair. I never used combs. With the flexible bristles I was finally able to comb my hair quickly without swearing all the time and I think anyone who has gotten used to these brushes will find it hard to find his way back to classic brushes. My first purchase was the golden little travel tangle teezer “Compact styler”, which I had found in a special offer. Immediately I was in love with it and did not use it for my handbag, but to comb my hair at home. At that time my hair was about shoulder-length, but with increasing hair length the brush was soon too small for me. So I decided to buy the tangle teezer “Salon elite”. I have been very happy with it ever since, only I was missing a handle and it slips out of my hand from time to time. I also clean my brushes every time I wash my hair and I sometimes had the impression that water was collecting in both brushes. That’s why I made my relatively new investment: the Wet Detangler. I must say I am extremely delighted, the bristles are even more flexible and gentle than the “Salon elite” version and the grip makes a huge difference, so I also get closer to the hair at the back of my head. No.1 is now in use in my handbag, No. 2 is used if I just want to comb my hair very quickly in the morning and No.3 for detangling before washing and during washing (with a lot of conditioner). I’m even thinking about buying the blow-styling brush after Kathrin from echtkathrin.de raves about it. These three brushes are a symbol for all those I have already bought, but with whom I don’t get along so well in the long run. No.4 is an detangling brush from Aldi-Nord, from the feeling even my dearest, because the bristles are extremely flexible, but with every washing water collects inside. In the long run, therefore, unfortunately, no solution. Brush No. 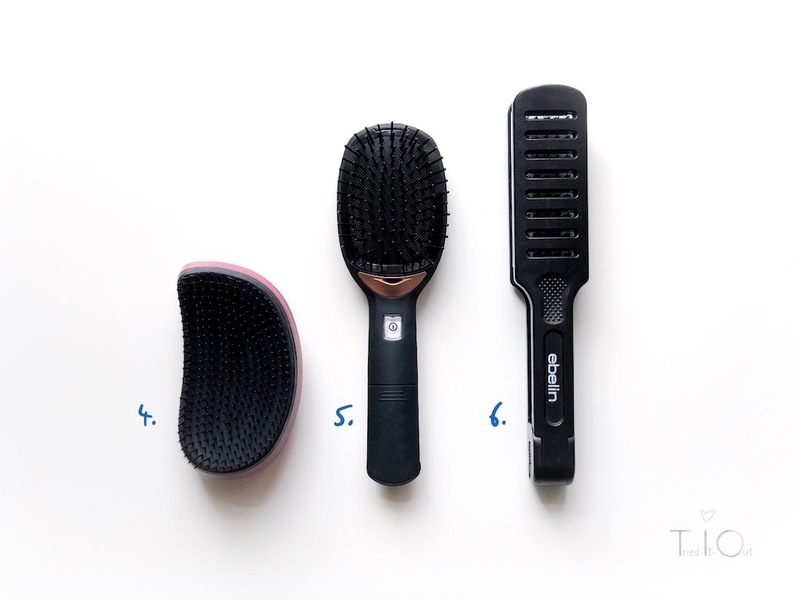 5 is from Lidl, it is an anti-static brush, which I even use now and then, but only for already combed hair, because it has classic bristles. The part with the bristles can be removed for excellent cleaning. Brush no. 6 is of the d.m., a brush to straighten the hair with the heat of the hair dryer and was for me a transition, after I wanted to do without the straightening iron. I have hardly used it since then, maybe I should give it away. Besides these three, I had several other hair tools, such as a wild boar bristle brush (difficult to clean and not compatible with my vegetarian / vegan life), round brushes (I never had the patience to blow-dry my hair in shape) and wooden brushes (here too cleaning was a big problem as the wooden bristles became more and more brittle). By the way, if you want to know how to get my hairbrushes clean, take a look here. 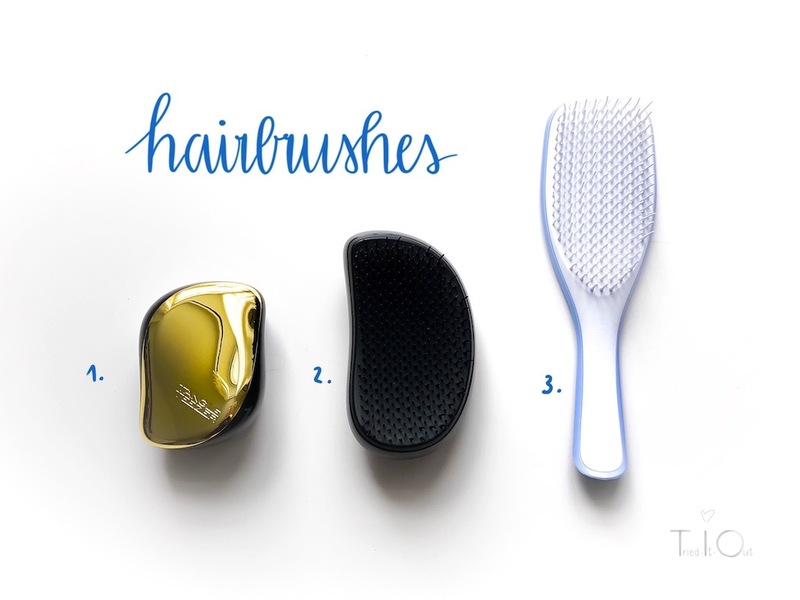 Which hairbrush do you love the most?